Metatron is a 2 oscillator analogue synthesizer with an arpeggiator that works alongside a gated modulation sequencer for creating unique rythmic patterns and sounds. The oscillator section uses waveforms that double up to create a phasing effect similar to pulse width, but for each waveform. This along with a powefull unison detune section and ring modulator give Metatron a rich, fat sound. 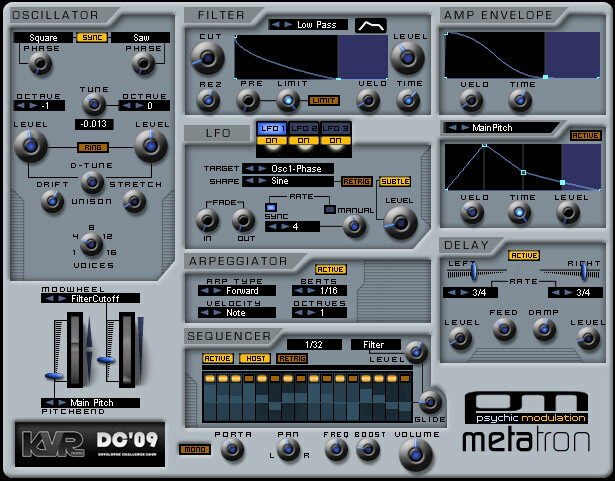 With the addition of versatile graphical envelopes, LFO’s and other modulation options, Metatron becomes an instrument that can create complex sounds, but at the same time keeps it simple without trying to do everything, making it a perfect ‘go to’ synth for one-finger basslines, rhythmic techno leads, spacey gated pads and other creative arpeggiated sequences.